A suspected agent of nongenetic inheritance—double-stranded RNA (dsRNA)—has been caught in the act. It has been observed leaving a parent’s circulation and entering an unfertilized egg cell, where it persisted even after the cell’s fertilization. Most significantly, the dsRNA’s gene-silencing effect also persisted, affecting gene expression in offspring. The finding that dsRNA can be passed from one generation to the next—and acts so simply, so directly—comes as a surprise. It had been suspected that dsRNA would have to act indirectly, by altering parental DNA, which would then be passed on to offspring. Presumably, circulating dsRNA would be vulnerable to the natural defenses of living cells, which act to counter dsRNA from viruses. 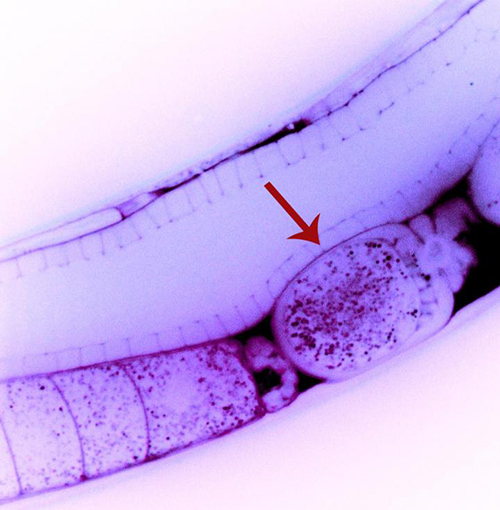 Yet dsRNA was observed being directly transferred between generations in the worm Caenorhabditis elegans. Fluorescently labeled dsRNA was introduced into the worm’s circulatory system, and then the dsRNA was watched as it physically moved from the circulation of a parent worm into an egg cell that was carried by the parent and waiting to be fertilized. In a surprising turn of events, some of the dsRNA molecules could not silence genes in the parent because the dsRNA sequence did not match any of the parent's genes. But the dsRNA molecules did silence genes in the offspring, when the new worm gained a copy of the matching gene from its other parent. This suggests that, in some cases, gene silencing by dsRNA might be able to skip an entire generation. These results, the authors concluded, demonstrate the transport of extracellular RNA from one generation to the next to regulate gene expression in an animal and thus suggest a mechanism for the transmission of experience-dependent effects between generations. Recent research has shown that, in some species, parents' life experiences can alter their offspring. Being underfed, exposed to toxins, or stricken by disease can cause changes in a parent's gene expression patterns, and in some cases, these changes can be passed down to the next generation.